This sign is for Bournville Cocoa Cadbury. The sign’s colors are yellow, blue, white, and brown. 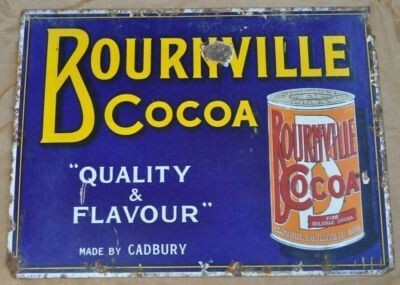 The text on the sign reads: Bournville Cocoa Quality & Flavour Made by Cadbury. The sign shows a can of Cocoa to the right and decorative text surrounding.